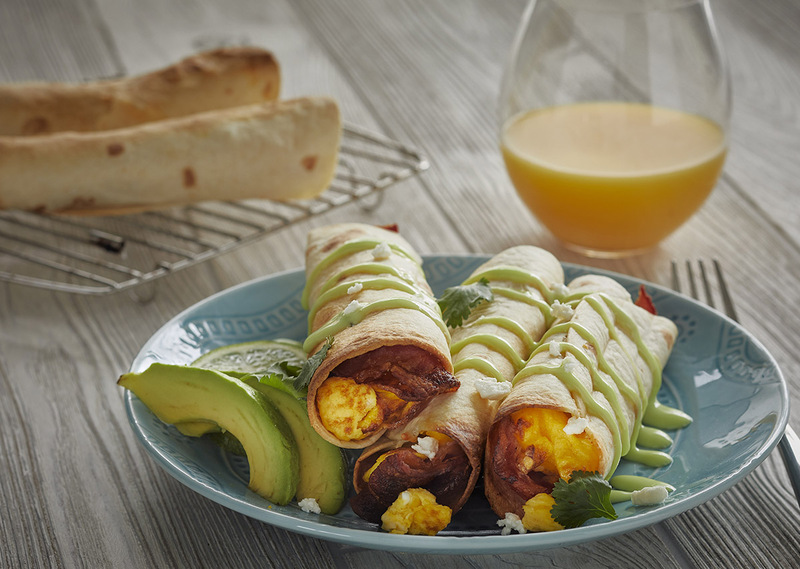 Break the Tradition: Traditional flautas are deep fat fried, but these crispy air fried breakfast flautas will squash any morning hunger pangs in a healthier way. In a large skillet, melt the butter over medium heat. Add the eggs and scramble until just cooked, about 3-4 minutes. Remove from heat and season with salt, pepper, cumin and chili powder. Spread cream cheese down the center of each tortilla. Lay one piece of bacon on top of cream cheese and top with scrambled eggs and shredded cheese. Place baking rack in the bowl in the low position and place 4 tortillas, seam side down on top. Tap the bake button and set temperature to 400°F and fry for 10-12 minutes, until tortillas are crispy. Remove and repeat with remaining tortillas. Meanwhile, add all avocado crème ingredients to a blender and blend on low-medium speed until smooth. Spread avocado crème over flautas and top with cotija cheese.